This was my most recent attempt at a 3D pumpkin carving, a spooky tree and mini jack o lantern. I payed a little more attention to the weight vs size of the pumpkin as to pick a dense feeling gourd to ensure thicker walls to work with. It looked really good with the light in it but the photo does not do it justice. This is something silly I did on the back of my first pumpkin after I realized the walls were to thin to do do what I originally wanted to do. So I wanted to carve a 3D face in my pumpkin but I did not do a good job picking it out and the walls were too thin to really get enough depth. The positive news is I found this great de-seeder / scraper meant for pumpkins but I think will work for honeydews and cantaloupe too! It worked so fast and easy, it really took the hassle of taking the seeds and stringy mush out! The other great result of me carving is pumpkins seeds, I love making roasted pumpkin seeds(and I hate wasting any part of food that you can use)! This is a batch I roasted with olive oil and salt but I also make a sweet version with sugar and pumpkin pie spices. The Great Pumpkin Search Has Ended - Pumpkin Carving To Follow! After calling around for 2 hours trying to find a pumpkin at a local farmers market with no luck and then asking everyone I know that lives near me if they have seen a pumpkin patch .... nothing! I was completely bummed, I want to carve a pumpkin!! The very next day, I drove past the very first farmer market that I had called and they had tons of them ... yippie! 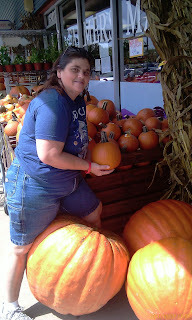 I am hoping to carve at least one a week until Halloween, check back for pics! I want to get one of these big boys! 3 months … that is how long it has been since I posted anything on this Fruit Carving and Vegetable Carving blog (or any of my other blogs either!)! During the peak of the summer season when perfectly ripe watermelon, cantaloupes and honeydews beg to be shaped into something new and awesome … well, I was recovering from having my torn shoulder muscles sewn back together, which coupled with the post surgery therapy was a very painful couple of months!! But enough of the negative in the past, looking forward to the fall season including the cooler weather as well as PUMPKINS TO CARVE!! I watched two shows on Food Network Sunday night that really got me itching to carve a pumpkin. First, they showed a repeat from 2010 of a “Pumpkin Challenge” that was pretty cool and I don’t remember seeing last year. Than the have a new series called “Halloween Wars” which is a four week elimination competition that has 5 teams of three people; one pumpkin carver, one sugar/candy maker and one baker. The teams have to add all three elements on to one show piece for each challenge and at the end of each episode one team is eliminated. I was pretty sure I was going like it but I really loved it! The professional carvers on the show are awesome and I love seeing their fast action techniques and what tools they use. In fact, I was surprised to see that all of the carvers used completely different tools than one another …. expensive Thai style carving knifes, run of the mill paring knifes, exacto knifes, chef knifes, etc. Of course I also enjoyed the candy and cake aspect of the challenge too but I was just excited to see great fruit carving on Food Network!! Anyways, I have tons of ideas now all I need to do is find someone selling pumpkins this early! !